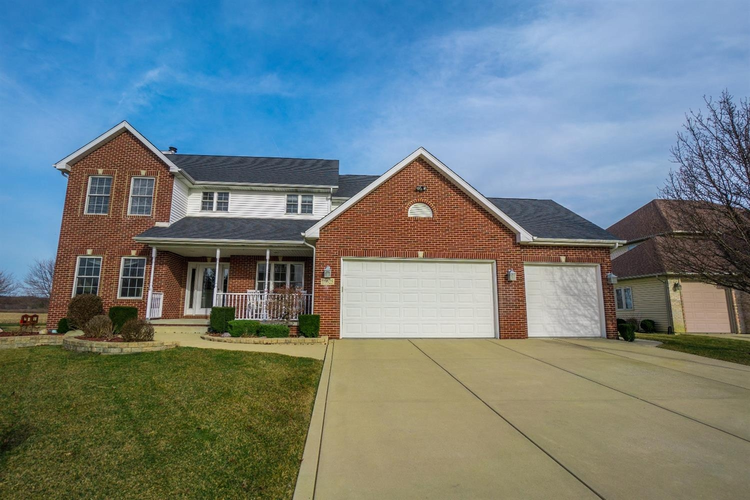 This EXQUISITE 2-STORY HM w/4 Beds 3 Baths, over 2,600 sf w/its Partially Finished Basement. THIS LOCATION IS A MUST SEE as HM backs up to farmland and has NO BACKYARD NEIGHBORS! Open Concept Floor plan w/MFloor 9' Ceilings throughout. LARGE UPGRADED EAT-IN KITCHEN w/Loads of Upgraded Cabinets & Counters, Island, Accent Glass Door Cabinet, Crown Moulding, Upgraded Lighting, Knobs, Extra Deep Sink, Pull-Out Faucet, Ceramic Tile & Pantry! PLUS STAINLESS STEEL KITCHEN APPLIANCES STAY! Upstairs Master Bedroom features Large WICloset,Private Full Bath w/Extra Cabinets, Separate Shower & Whirlpool Tub! Partially Finished Basement w/Rm to expand! Amazing views from rear of HM w/its Private Backyard, Huge 20x16 deck w/Pergola & Built-in Lighting, 19x14 Patio & 12x10 Shed! 3-Car fully finished Garage w/loads of extra storage! PLUS 1 Yr HM Warranty! This HM is a MUST SEE! MAKE YOUR APPOINTMENT TODAY!!! Directions:Broadway to 109th. East on 109th. After I65 overpass, Turn Left on Maine Drive. House is on the Right Side of Street.